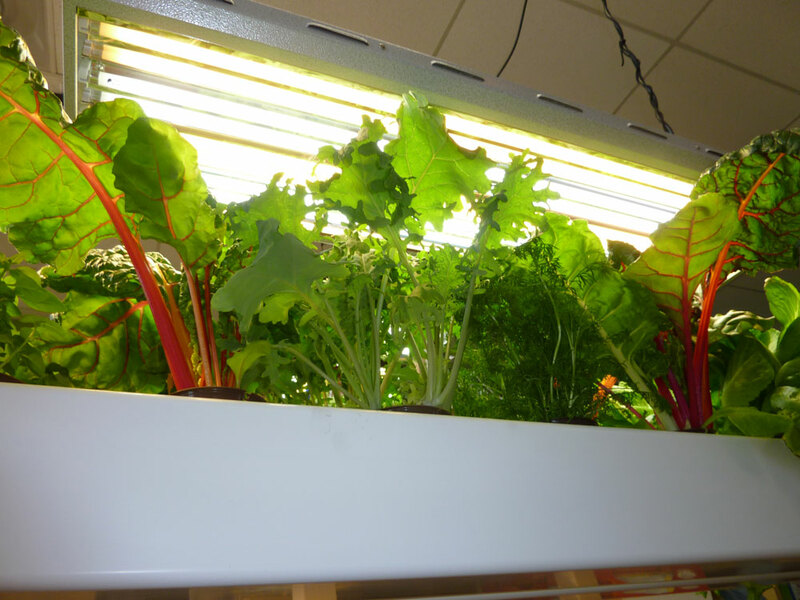 Fluorescent grow lights are great to use for the vegetative growth of plants, seedlings, and clones as well as being optimal for growing herbs, small plants and greens (i.e. lettuce, chard, etc.). The reason they work well for these applications is because fluorescents put off the optimal light spectrum for vegetation growth, consume a relatively low amount of energy, and produce very little heat. Additionally, maintenance is little-to-none on fluorescent grow light fixtures and replacing bulbs is inexpensive and infrequent. Kale, herbs and chard thrive under T5 fluorescents. The common type of fluorescent light being used currently in the hydroponics and gardening industry is the T5 because it is the most efficient fluorescent on the market. In grow light terms, efficiency is typically referring to lumens-per-watt (LPW), which is where the T5 (103 LPW) excels over its predecessor, the T8 (92 LPW). One thing to keep in mind when using fluorescents is the fact that their intensity is very low relative to HID lights and, of course, the sun. This being the case, it is ideal to have your plant footprint closely equal that of the size of your fluorescent fixture. For example, if you are growing tomato plant starts and you wish to use a T5 fixture with four 4-foot tubes, the measurement of that light will be roughly 4’x1’. As such, you would want to try to keep your tomato starts within a 4’x1’ perimeter beneath the T5 light. This isn’t necessarily a rule to be abided by strictly, but a good guide for optimum growth. Also, relating to the low intensity of fluorescents, you can and should have your light positioned close above the canopy. On established plants, about 2-4 inches is adequate but much more distance will be necessary on seedlings or more light-sensitive plants. For T5 fluorescents, compact fluoresents (CFLs), LED grow lights and a multitude of other Grow Lights in the Boulder, Denver, Colorado area, visit our Hydroponics grow store or shop our online store.